Legendary shooter Jerry Miculek of Princeton, Louisiana won the Open division at the U.S. Practical Shooting Association’s (USPSA) 2010 Multi-Gun National Championships this past weekend at the Desert Sportsman’s Rifle & Pistol Club in Las Vegas, Nevada. Miculek, who finished second in 2009, has won the title previously in 2008, 2007, and 2005. His first place finish this year also earned Miculek the Senior Open division title. This was an impressive come-from-behind victory by Miculek, who trailed most of the match. Jerry grabbed the lead on the 10th of 12 stages, then held on to win with a final score of 1997.2577. In winning his fourth USPSA Multi-Gun Championship, Jerry out-gunned dozens of other shooters half his age. Maybe those young bucks should buy Jerry’s Practical Rifle DVD in which he explains his techniques. Though some of his younger competitors could cover ground faster, Jerry was ultra-accurate with his rifle, scoring hits faster than the younger shooters. As Jerry told photographer Yamil Sued: “Son, if I’m going to do something, I’m going to do it right.” In the video below you can see Jerry competing in the 3-Gun Nation Championship, which was held on Monday, immediately after the USPSA event. “Jerry is one of our sport’s most respected competitors. There is no match that he enters that he is not among those favored to win and that’s certainly true when it comes to Multi-Gun competition,” said Michael Voigt, USPSA president and the defending Multi-Gun champion who finished second this year behind Miculek. Voigt’s final score of 1963.7636 placed him second in the match while Taran Butler finished third with 1927.1224. In the Women’s Open division contest Maggie Reese of South Pasadena, California took top honors, winning six of the 12 stages and posting a final score of 1272.8205. This gave Maggie back-to-back USPSA titles, as she also won the Womens’ Multi-Gun Championship in 2009. A soft-spoken, humble competitor, Maggie really dominated her division in this event. She is a deserving Ladies’ Champion. Maggie’s final total was more than 155 points ahead of second place Vinky Castillo’s score of 1117.8194. In the Tactical Division, SGT Daniel Horner of the USAMU successfully defended his USPSA Multi-Gun Tactical division title. The Army shooter, who won five of the 12 stages, finished with a 2075.0824 score, beating his nearest competitor by more than 218 points. Then, one day after securing his USPSA Tactical title, SGT Horner won the first-ever 3-Gun Nation Championship, capturing a $25,000 cash prize donated by Leupold. Cave Creek, Arizona’s Tasha Hanish, a member of the FNH USA shooting team, won seven of 12 stages and dominated the field as she won the Women’s Tactical division title for the second year in a row. Hanish won the first four stages of the match, jumping out to a 62+ point lead over FNH USA teammate Dianna Liedorff. Hanish won the title with a final score of 1252.3448. Liedorff finished second with 1095.2133. Watch Tasha in action in the video above. 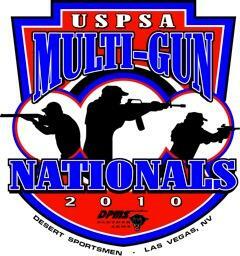 More than 150 top shooters from 26 states, as well as Canada, competed in the 2010 USPSA Multi-Gun Nationals. Despite the brutal heat, which reached the mid-90s, these shooters managed to “run and gun” for four days straight, sending over 19,000 rounds downrange during the competition. Jerry Miculek and Maggie Reese action photos © 2010 by Yamil Sued, HotGunShots.com. Share the post "Jerry Miculek and Maggie Reese Win USPSA Nationals"
Beretta U.S.A. Corp. has discovered a potential condition with Beretta .22 caliber NEOS semiautomatic pistols in which the pistol will fire even if the safety is activated and, in some cases, the pistols may fire if the safety is moved from the OFF to the ON position. Because of safety concerns relating to this situation, Beretta U.S.A. Corp. is immediately implementing a recall of Beretta .22 caliber NEOS semiautomatic pistols. If you have a Beretta NEOS pistol, send it to Beretta’s Accocreek, MD Service Center for repair. Instructions on how to send your Neos to Beretta are available at www.berettasupport.com/neos or by calling 1-800-BERETTA. Note: Some pistols are not subject to recall. Please visit www.berettasupport.com/neos to see if your NEOS has already been repaired. If the firing pin for your NEOS looks like New Version 1 or 2 above, you do not need to return it. Returned NEOs pistols will be retrofitted, at no cost to the owner, with a replacement firing pin assembly. The new firing pin assembly can be identified either by a circle on the back of the firing pin that includes a red dot in the center, or by a vertical line as shown in the photos. Please make sure that your Beretta NEOS pistol is unloaded before delivery to the service center. Do not experiment with your Neos pistol to see if it has the potential safety issue. Share the post "Beretta Recalls .22 Caliber NEOS Pistols"